* How to photograph your work. * The Gray Under Painting, why we do it. 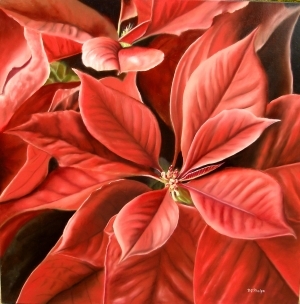 * The Poinsettia, do you know its story? * How to Make your own easel, cheap! * Christmas Sale is on! How to photograph your art. I have an entire section on the site that discusses the ins and outs of photographing your work. In todays world, it's simply a must for you to be able to spread the word (and pictures) of your artwork if you're in the business of selling it. I've added a short film on how to completely eliminate glare. This is especially important if your work is behind glass, or you paint in oils that have a shiny finish. 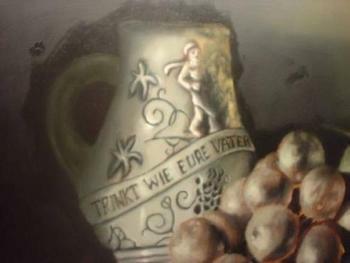 The Gray underpainting, why we do it. Here's another part of the flemish process that folks like to work around. Some can do, some can't. I'm in-between. Some paintings done without this layer seem to work ok, but some simply don't have the depth that doing this seems to give your painting. Those tricky half shadows that seem colorless are so hard to create without the gray under painting. Once completed, a simple glaze of color into that half shadow and full shadow will have that richness and depth that will have folks wondering how you did it! Click here to get even more details on this important part of your painting tool box. The Poinsettia, do you know its story? This time of year always brings these beautiful plant to our attention. Do you know the story behind it? It's known as a Lobster Plant, a mexican fire plant, a flame leaf. So how's it associated with Christmas? Find out here, The Poinsettia, so much is behind this little plant! How to make your own easel, cheap! So, this link is going to take you to a YouTube channel. It's done by a great artist, Mark Carder. He has some great free instructional videos, and I thought this one was particularly good. In the video, he puts together a great and sturdy easel using simple tools and 2" x 4" lumbar. 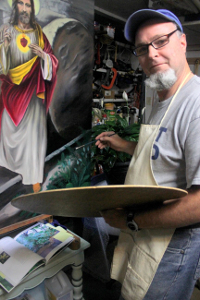 Click below to see it, and while you're there, check out some of his other cool stuff. 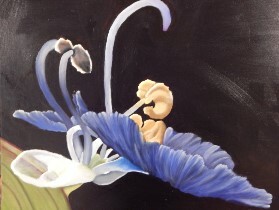 This painting was submitted by Barbara, and what a beauty. She's also included all of her progress images from sketch to finished painting. Go see her work! Here's another work done by Lori! 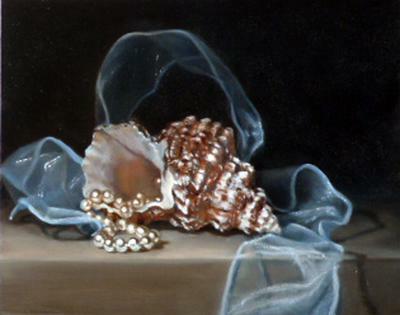 The composition and handling of the sea shell, pearls, and ribbon are simple wonderful. Congratulations in creating a great piece. Check out her talk here! So, some of the Christmas lights are up, and plans in place as family and friends schedule their comings and goings for the celebrations to happen soon. Then, my web guru says it's time to run the sale, so, if you've been undecided about picking up the e-Book or the DVD on the Flemish technique used to create these works, now is the time. As you know if you've been on the site for a while, I only do this a very few times (twice usually) a year. It's just too much computer time for me. I'd rather be painting then changing price schemes and ads.